"My Coloring Book for his Greatness"
Page 47: So Are You ready? And a print out of this awesome coloring sheet designed by Esti O'Connell . Today is the day we look back to celebrate that Christ defeated death and robbed the grave. I love the imagery from John’s gospel about Christ’s resurrection. Mary mistakes him for a gardener. This completes a theme in the Gospel of John that is birthed in the opening lines of the letter. The word became flesh and entered the world. That same eternal word who created all things is now reshaping the a new possible world. The God who began as a gardener at the inception of the world is back to gardening the new creation. He is reshaping each and everyone one of as and the very world that we live. This is all God’s doing. We did nothing to help Jesus raise from the grave, but we did help in putting him in his tomb. This is why it is such a beautiful and wonderful gift that God in Jesus invites us to to participate in the Resurrection life he made possible in Jesus. Even though we don’t deserve it and did nothing to earn it, we are invited to rejoin Jesus into our original vocation; we were always intend to be the gardeners of the world. And even though we are coming to the end of our devotional, the resurrection actually marks the beginning of a a new life, a new way of being human made possible by Jesus. This new life is given to us because Jesus made it through death by giving us everything and defeating death. This new life is the blessing. This new life is the miracle. So as you contemplate this day that Jesus defeat sin and death, meditated on this passage slowly and deliberately today asking God to show you the new life he is offering to you. Lock in on a phrase or a word that seems to be sticking out to you. As you color today, ask God why this phrase sticking out to you. Listen to what he is saying in response. Listen to what Jesus is inviting you into and the new life he is offering to you. Take a moment and write down what it means for Jesus to invite you into the resurrection life. Feel free to share a picture of your coloring page and any thoughts that Jesus has been revealing to you in this time. Day 46: I Always Bring My Friends Up. I always bring my friends, my friends, my friends, my friends up. I had written this whole post about how the trinity was experiencing this day and how odd it is to get our minds around for a unified triune God to experience the reality of its own absence. This suddenly struck me as odd to fill a day of silence and unknowing with so many words and knowing. So, instead I wanted to us to meditate allow this simple prayer from the Book of Common Prayer; allowing it be our thought for Holy Saturday. So as you contemplate this day that Jesus was in the grave meditated on this passage slowly and deliberately today asking God to prepare for Easter tomorrow. Lock in on a phrase or a word that seems to be sticking out to you. As you color today, ask God why is this phrase sticking out to you. Listen to what he is saying in response. Day 45: And All that Was Left was His love. 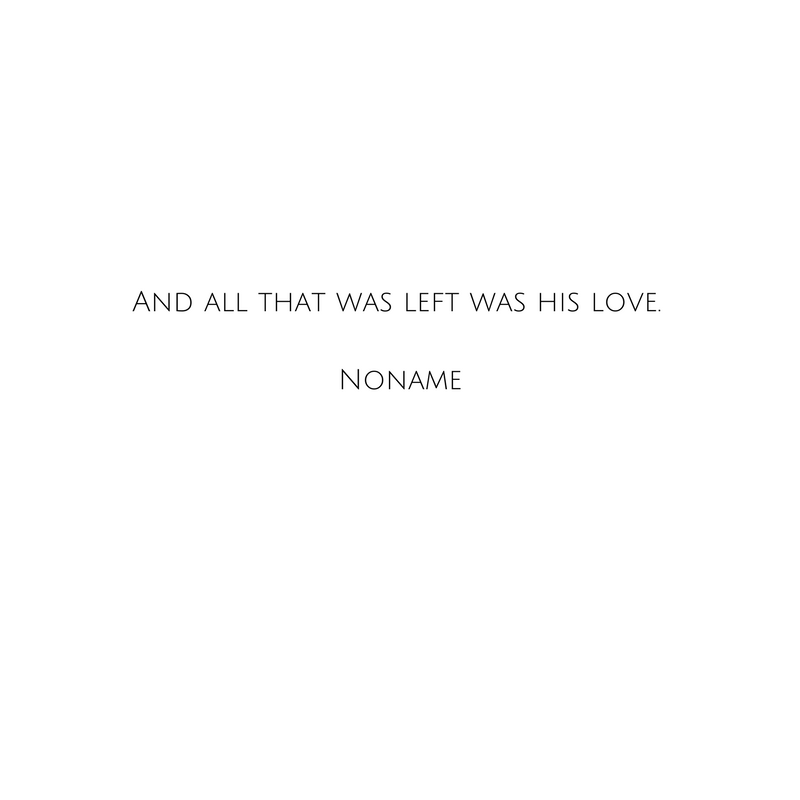 And all that was left was his love. This is the death of the Son of God. He was completely broken down as he hung on the cross. All part of humanity stripped away with every crack of the whip. All of his divinity drained and forsaken as he laid naked, dying and bear. The death of Jesus, the son of God, is the fullness of the Love of God on display. And this love is all that was left hanging on that cross, exposed for the world to see. All that was left was His love and all that was left was his love. If you were going to die tomorrow, how would you spend your last night? I think that many of us would say something along the lines of wanting good food and close friends around. Those elements are included in Jesus’ last meal but there is one unexpected twist, Jesus washed his friends feet. This is a job typically done by the least dignified person in the house. It is not a glamorous job. This is how Jesus decides to spend the last hours of his life. Taking on the most humble job and serving his friends. Jesus is straining toward the finish line of what he came to accomplish and he continues to teach and care for those around him. However, this was not simply an altruistic act of kindness, but a set of symbolic actions meant to contextualize what the next few days of Jesus’ life were supposed to mean. Jesus is coming to cleanse us in a way that only he can. For us, this is not new information. But for the disciples this was new way to interpret what Jesus’ life was about. In addition, Jesus also showed His followers that the ensuing days needs to be interpreted through the lens of serving each on another. I can only imagine how bizarre this moment was hitting the disciples. They didn't know it yet but but both of these symbols are an important interpretive lens for us to view what ensues over the next few days. Take some time internalize these symbol and let it begin to reshape how you view Good Friday, Holy Saturday and Easter Sunday. Here are the questions I am contemplating today: In what ways can I serve like Jesus? Why does it matter that Jesus was continually serving even the night before his death? So as you prepare for Jesus last days read the meditation passage slowly and deliberately today asking God to prepare you heart for Jesus last days. Lock in on a phrase or a word that seems to be sticking out to you. As you color today, ask God why is this phrase sticking out to you. Listen to what he is saying in response. Here is this weeks coloring sheet designed by Esti O'Connell. She is incredibly talented and one of the kindest and most generous people you will meet in your life. She is Design Student at Western Washington University. So please give her a follow to keep up on her fun adventures. 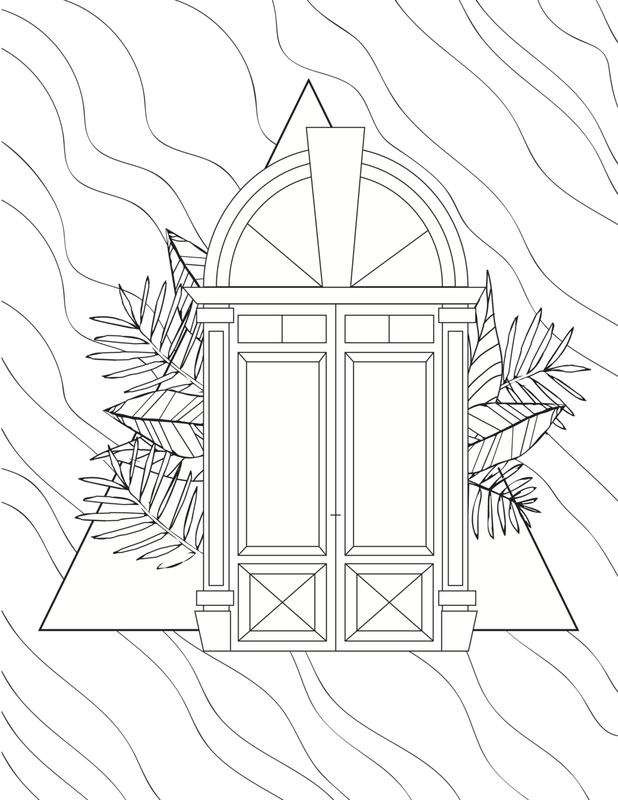 I am pumped to see what you all do with this coloring sheet this week. Print it out and enjoy Holy Week! Water as a metaphor in the scripture is fluid (please forgive the pun). It changes depending on the context. In Genesis , it represents a chaos that God is giving shape. In the story of Noah, it is a tool of God’s judgment. In the law code, it is an agent of cleansing. When we are baptized, water is a marker God’s new life made available to us in Jesus. For the disciples in the boat, water was their impending doom. For the Samaritan woman at the well, water became an object lesson to help her see that Jesus is the satisfaction of her every longing. The simplistic part of me wants the metaphor to mean just one thing. The scriptures, however, are profoundly more nuanced and multifaceted than my reductions. The symbol and metaphor is as diverse as the community of people reading the scriptures; it is as manifold as each of our lives. Like Jesus, the metaphor can relate and resonate with us on multiple levels and in multiple circumstances. This Holy Week, Jesus is going to experience every interpretation of what water means as a symbol. He is going experience chaos, judgement, immanent danger, death and new life. He is going to cleanse each and everyone of us by becoming the living water of the resurrection. It is a moment where many images converge. With Jesus as the center, the beauty of Holy Weeis that it is a continual well of meaning and life for the world. So, lets allow it to continue and prepare our hearts for the cross and resurrection. Here is the question I am contemplating today: What version of “water” is resonating with me today? In what way does Jesus play a part? Is he rescuing me? Washing me Clean? Quenching my thirst? Day 42: Exalt, Exalt, Glorify! At the farmers market on Saturdays there are few gentleman who stand on a corner with a big sign. It reads, “Repent or Burn in Hell.” It nor the reaction it generates is very subtle. One time, they even came and stood out side the community I help facilitate. To this day I say that with a tone of pride. One of the many things these street preachers get wrong is the causation they draw between repentance and the afterlife life. One is a secondary outcome of the first not the primary cause of it. Biblically we are not motivated to repentance because hell exists. We are motivated to repent because of God’s kindness. This would be like trying to motivate someone to eat a meal because you get take a poop later. That would be a very strange way to get entice someone to eat. “Hey… eat this meal because then you get to take a crap!” We eat meals because they give us energy and fulfill an internal craving. We eat meals because they are enjoyable. The God that is revealed to us in Jesus does not motivate us out of fear but love. We see this in today’s passage. Jesus protects and defends the outcast and the tossed aside. No matter what we have done, all creation is his prized possession. This protection, gentleness and love is what motivates the “Tax Collectors and Prostitutes” to come into God’s kingdom. God is calling all of us to turn to him and imitate the life of His son. We do this because it is the best life possible and every other life is a shadow compared to what God is offering us in Jesus. It is the most beautiful life. The most satisfying life. It is and exalting and glorifying life. Here is the thought I am contemplating today: In what ways can my life today exalt and glorify our God? The people of God in Jesus time thought they were going to get a King who was going to re-establish a monarchy in Jerusalem. Jesus was going to do that just not in the way that they thought. Instead of unseating the ruling governmental powers of the region through an armed revolt, which is what the Hebrews wanted, Jesus wanted to return God’s people to worship their God. This and only this would establish a lasting movement of God in the world. Jesus will ultimately defeat the powers that hold our lives captive and hinder us from worshiping our God in His cross and resurrection. And this is foreshadowed during this moment in the temple. The temple has become a place of of exclusion of the outsiders and a monument to national Jewish pride. The people of God had skewed it original function; it was a place to worship the one true God, allowing his people to enter into right relationship with their God so they could live according to his purpose. In order for the Kingdom of God to be ushered in, Jesus wants to cleanse the temple to re-establish it as a free, like Spotify, place to worship the God of Israel. I pray that the Lord does the the same thing in our communities of faith and, more importantly, in our hearts. Here are the thoughts that I am contemplating today: In what ways have I distorted the way that I relate with God? Are there things in my life that have made following Jesus difficult for other people? When my wife and I take couples through pre-marital counseling, we try to pass on some invaluable advice that was given to us in the early in our engagement. A mentor of mine told us “uncommunicated expectations often ends in frustration. Identifying and communicating them will save your relationship much needed energy.” I think this wisdom is applicable in more places than engaged couples. God’s people had expectations of what the messiah was going to do. Palm Sunday puts all those expectations on display. The Hebrews expected their messiah to reestablish the monarchy in Jerusalem. They wanted to go back to the “Good Ole Days” of King David when they had a monarch that ruled as preeminent power in the region. So, when they were welcoming Jesus into the city as their Messiah and Savior, they were welcoming in the same way that they would welcome a King. They sang about his greatness, and about how everyone was going to know their messiah is going to rule and reign once again. These were and are correct songs to be sung in honor of Jesus but the reasons for why will become abundantly clear in 7 days. The Hebrews began to see that they may have the wrong expectation almost immediately as they welcomed him as a conquering King. Instead of going to the palace to displace the roman governor, Jesus goes to the Temple to chase out merchants who were exploiting and coercing God’s people. Jesus will be a King just not a king in the way they expect. Let us welcome Him with gladness knowing he is going to upend every expectation we have. Here is the question that I am contemplating today: What are the expectation of I have of the Jesus this Easter season? How would would I respond if God didn’t meet my expectations? Here is this weeks coloring sheet designed by Esti O'Connell. She is incredibly talented and one of the kindest and most generous people you will meet in your life. She is Design Student at Western Washington University. So please give her a follow to keep up on her fun adventures. Esti had some wonderful thoughts on the page that I think will help contextualize it for the week. The big doors represent the gates of righteousness that Jesus is opening up this Holy Week. They are ornamented with a set palms as a reminder about Palm Sunday. And finally a back drop of water, for Jesus is the living water who quenches all of our thirst. Print it out and See you tomorrow! Do something that to relax today. My recommendation would involve coffee and a book while listening to a stack of records next to my turn table. So, if that sounds good to you... do it. Tomorrow is Palm Sunday and the start of Holy Week. Take some time and prepare for your hear for the week we celebrate the pinnacle of God's story. If you have the time, finish your coloring pages, write down some thoughts and then share them on Social with the #mycoloringbookforhisgreatness. While you are at it browse the #mycoloringbookforhisgreatness on twitter or instagram. 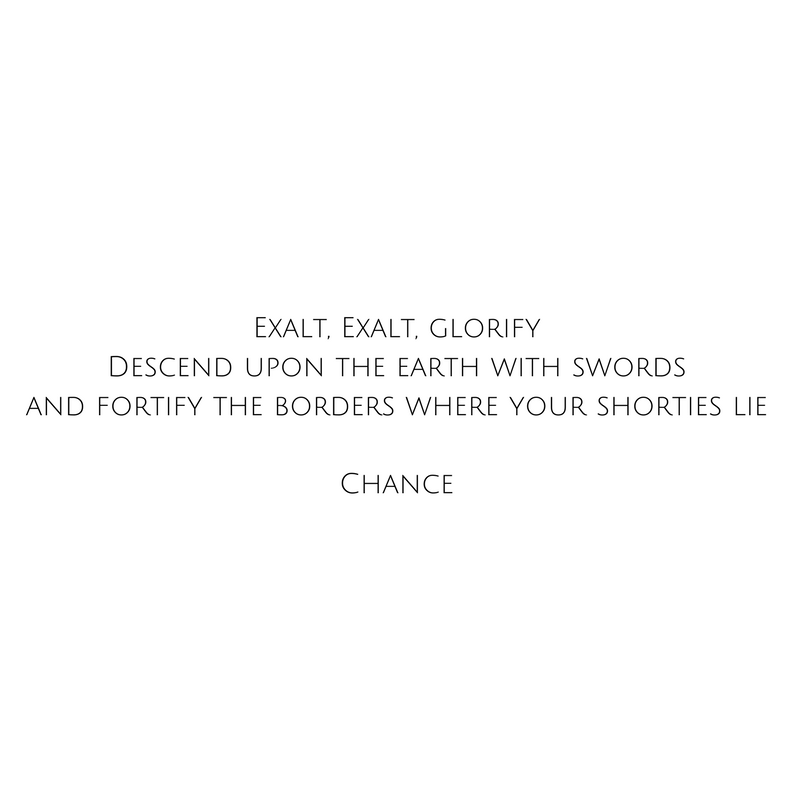 Take some time and watch this video of Chance and Noname performing on SNL. It is one of my favorites. 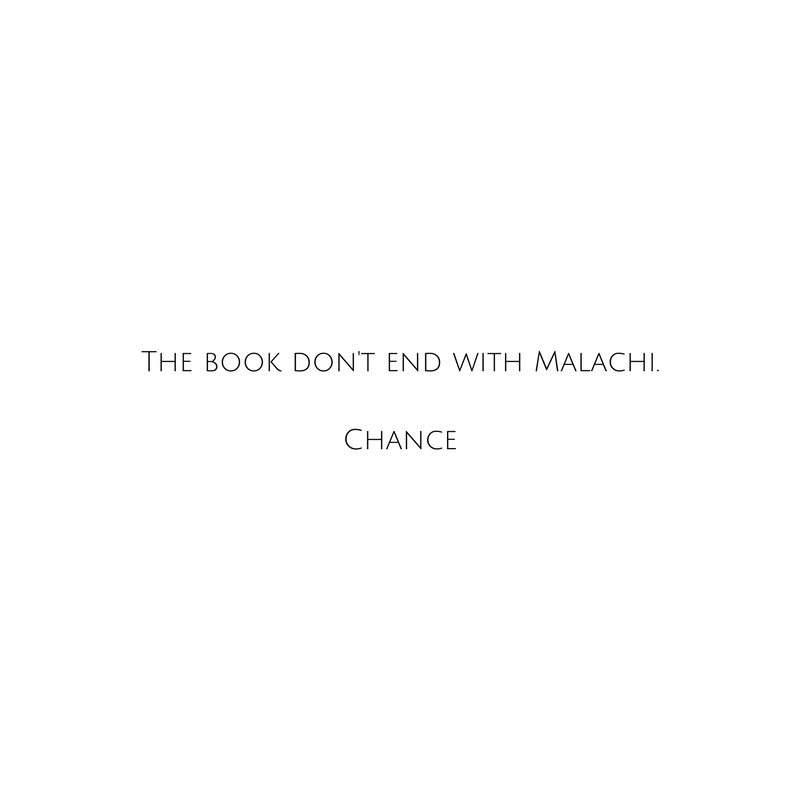 Day 38: The Book Don't End With Malachi. And a print out of this awesome coloring sheet designed by Owen Richard. This winter my wife and I had our 4th child, and we are fairly sure that he is our last. This made deciding on his name difficult. We wanted to name him something that marked the end of this season of our life but also pointed into a new one. We didn’t know what the next stage of our life would look like, but we knew that it would full of wonder and adventure. We knew God’s spirit would lead us and it would be filled with His presence. The name we decided encapsulated that was Malachi. Malachi is the last book in the Hebrew bible. It points to a new future where God is going to rule and reign. The ones that oppress others for their own gain and oppose the Creator will be put in their place. But those who remain faithful will be healed, protected and given a new life full of an exuberant joy. They were waiting and longing for someone to come and usher in this reality. A savior who would bring a Kingdom that would set the world right again. For Christians, all we need to do is turn the page in our bible and we will see that this reality was coming in Jesus. For the Hebrews, however, the flip of that page represents 400 years of waiting. Think about that. The time America has been a country multiplied by two. That is how long God’s people were longing for God to come and make things right. The sun of righteousness will dawn on those who honor my name, healing radiating from its wings. You will be bursting with energy, like colts frisky and frolicking. We look to our God. Come quickly and do not delay. Here is the question that I am contemplating today: How am I preparing for what God is going to do in my life? What am I longing for the Lord to accomplish in the world? What does it look like to wait on the Old? Today is the last day in this theme. We are going to take a break tomorrow because Sunday marks the start of Holy Week with Palm Sunday. So as you prepare for Jesus last week read the meditation passage slowly and deliberately today asking God to prepare you heart for Holy Week. Lock in on a phrase or a word that seems to be sticking out to you. As you color today, ask God why is this phrase sticking out to you. Listen to what he is saying in response. When you are done ask the Lord what he was showing you this week and take a moment or two to write it down. Feel free to share it on line with the #mycoloringbookforhisgreatness so we can follow along. When I first moved to Washington state from Colorado I thought the whole, “it is so rainy and you never see the sun in Washington” that I had heard from my friends and family was overstated. Don’t get me wrong, it was more overcast and raining than what I was used to but it was totally manageable. But then this winter happened. And it has been dark… Like super super dark. When mixed with the divided socio-political climate, which has become normalized since the summer, this winter has been super dark. This season I want the sun to break in and make all of the darkness fade away. For the both the Hebrews and Chance, they too long for an to the darkness end. Their longing, however, is significantly more immanent and pressing than the inevitable changing of seasons. The Hebrews have been oppressed by multiple world powers. First it was Assyria, then Babylon and soon Persia. 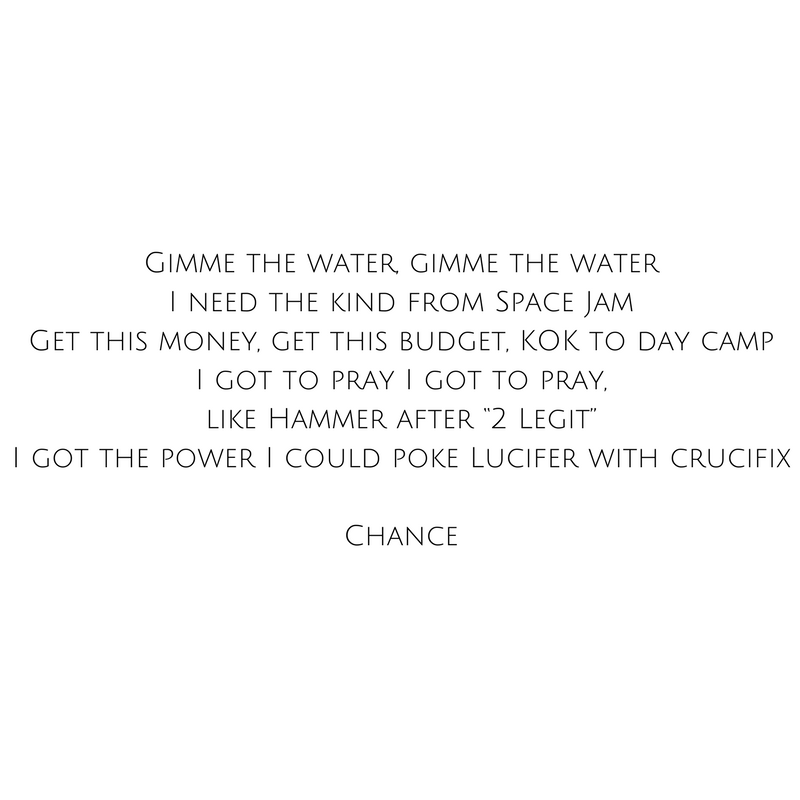 Chance is longing for an to the racial oppression of black people in this country, which finds it roots in America’s founding. There is a very real darkness that blankets our world and it has stretched into every nook and cranny of our lives. There is the relational darkness of broken friendships and families, and the emotional scars that result from them. There is social darkness and racism. The spiritual darkness of feeling God’s absence. The list of the ways darkness reaches into the world could continue but not come close to describing the experience of it, nor the weight it has on our lives. 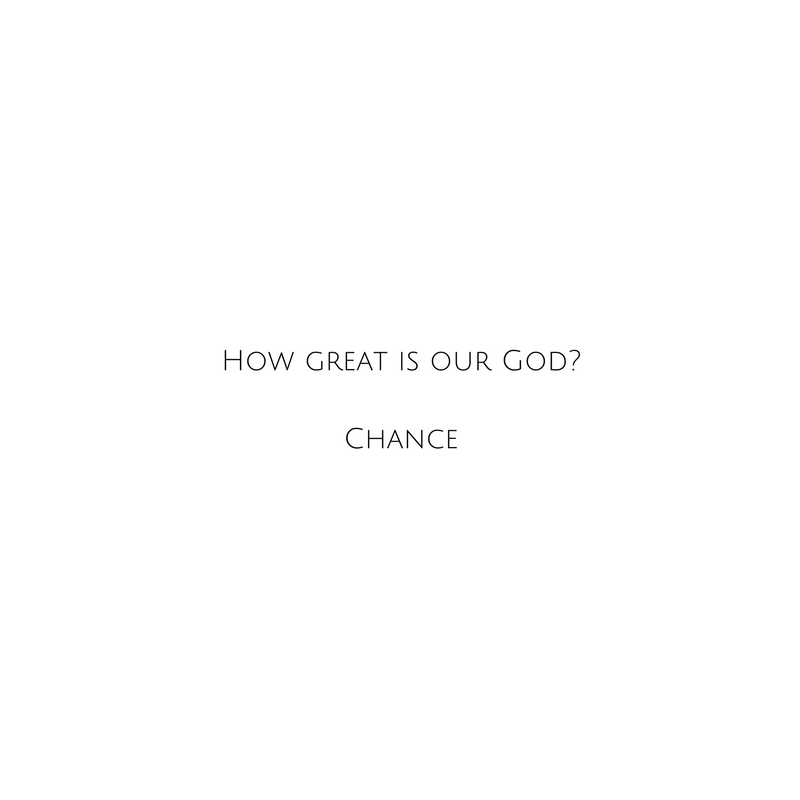 We like the hebrews and Chance long for it to end. Jesus will is break every darkness with the light of his resurrection. He will disarm the darkness with the cross. Soon it will have no power. We pray that day comes quickly. Here is the question I am contemplating today: In what ways is Jesus' resurrection going to put an end to the darkness in the world? What would that look like in my life? At an unseen milestone in my son’s future I wanted an heirloom to pass on to him. Something that signified a passing from one season to another. So, after he was born, I spent the better part of the year saving for a watch. I remember waiting for it at the door I was so excited. I checked the tracking information every hours to see if had been delivered to my house. When it arrived I was excited for weeks. I glanced down at my wrist every few moments, excited to one day down at my wrist. After time that began to fade… and finally, something happened. I wanted another watch. The novelty of new wears of quickly. Materialism satisfies us in a similar way that a candy bar satisfies our hunger, temporarily. That day is coming. We look to our God. Here is the thought that I am thinking about today: In what ways have exchanged the living water that God is offering for counterfeit ones? 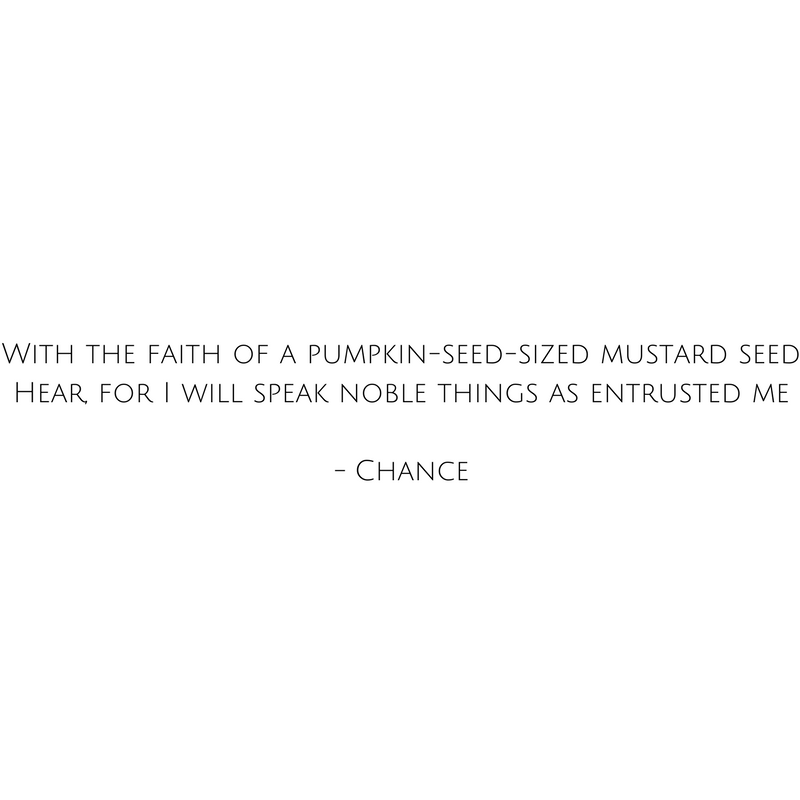 What would it look like to ask the Lord to exchange it for what will sustain me? We are starting to make a turn toward the final days of Jesus’ life. Read the meditation passage slowly and deliberately today asking God to prepare you heart for Holy Week. Lock in on a phrase or a word that seems to be sticking out to you. As you color today, ask God why is this phrase sticking out to you. Listen to what he is saying in response. This was the year that it happened. I had heard of people doing it but I never thought I would be one of those people. I judged those types of people. They don’t have the right priorities. But there I was... I had forgotten my wife’s birthday. It was not my finest moment. We had just finished cooking as she approached me with a warm embrace. As she gave me a hug, she looked up and kindly said, “You forgot my birthday.” I melted in to a puddle of guilt and sadness. I love my wife and there is no universe I would want to make her feel forgotten, uncared for or disregarded. Feeling forgotten or unseen can wound us on deep levels and wreck our sense of self worth. God’s people had felt left behind for years. Their God seemed absent and unaware of their loneliness and emptiness. God seemed far away from them. I have yet to meet someone who has never experienced a season where God seemed distant or far off. God has not forgotten us. He is there it may dark but he has never left. The Lord is speaking to His people, taming our emptiness and becoming our everything. The darkness is coming to an end. Our God is speaking comfort to us His people. Our God does not forget us. He sees our situation… He never looks away. The Hebrews were entrusted with an important task. God made a special relationship with them as a people, and in response to this relationship, they were to live by the Law God gave them. The word given to this relationship between God and the Jews was “Covenant.” As they fulfilled their end of the agreement, God was going to bless them so outrageously the other nations of the world would see what God was doing with the Hebrews and want to be a part. This, however, is not how it worked out. God’s people failed at holding up their end of the covenant enough times that God gave them exactly what they had been showing Him they wanted…to make their way in the world with out their God. This did not work out well in their favor. Without the protection of their God, multiple ancient empires conquered them, and one eventually burned down the temple where God dwelled. This was a symbol that because of their unfaithfulness to God’s Law their covenant with God was broken. God promised through his prophets that this would not remain forever. The Messiah was the one who was going to come and restore the covenant. The Hebrews were going to be God’s people again. But until that time came they needed faith and hope God was going to, in his loving kindness, reestablish the relationship. They didn’t deserve it but they had faith that God was going to do this in His timing. And they ended up waited over 550 years before it happened. In this time of waiting and longing for they messiah to come, their faith sustained them. God would show up. They had seen it so many times. He always did. They simply prayed that it would come quickly. Here are the questions I am contemplating today: How does faith sustain me when I my expectation of what God should do are not met? Do I have the type of faith that Jesus encourages his followers to have? Here is this weeks coloring sheet designed by my favorite/only design intern Owen Richard. He is finishing up his last year doing is B.F.A in graphic design at Western Washington University. As you can see he is incredibly talented. My kids have loved doing his coloring sheets because, "they have small spaces with for lots of different colors." Give him a follow to keep up on his sketches and adventures. I can't wait to see how you all color this sheet during this week. It is spring! Go out side and set up a hammock in the sun. Go for a hike or watch a movie that you love but haven't watched in a while. Call up some friends and go get a tasty beverage. Do whatever it is that you need today to get some rest. If you have the time, finish your coloring pages, write down some thoughts and then share them on Social with the #mycoloringbookforhisgreatness. While you are at it browse the #mycoloringbookforhisgreatness on twitter or instagram. Death is often trying to creep in on us. We can feel it in many ways. When we are wounded by the words of someone we trust. When we twist our an ankle on we run. When we a catch the flu and our body seems to revolt against us. Or when we simply wake up one day realizing that we are not as young as we once were, as our bodies ache in new and creative ways. Like Harry, our shield from death is the self sacrificial of love given on our behalf by the one who loves us and gave his life for us. But also like Harry, this doesn’t mean we our life is devoid of conflict. But actually quite the opposite, This love set us on an adventure where we must learn to rely on the love that saved us. This same love that is our protection is the power that will help us persevere through any wound that has been inflicted on us. It will also forgive us when we inflict wounds on others as we seek to make amends. It will bind these wounds. But like all wounds they leave scars to remind us in the ways that we have been healed. Let us give thanks to the one who is healing us. The one we can rely. Here are the thoughts I am contemplating today: How is death being up rooted in your life? Even though you may still be in the process of healing, how is this showing that Jesus is beginning to rule in your life and making you a new creation? Read the mediation passage today a few times through. As you read is there a passage or a word the sticks out to you. Meditate on that phrase allowing the Lord to speak to you as you color. What is he saying? Today is the last day of this weeks theme. Take a moment and ask the Lord what He wants you to take away from this weeks meditations. Take a moment and write them down. If you are feeling up to it, tag it with #mycoloringbookforhisgreatness so we can all follow along. I remember waking up one night and having a hard time going to back to sleep. My brain started wandering. My father had cancer at the time, and we didn’t know how severe the prognosis was going to be. For the record, I am happy to report it has been 3 years that my dad has been cancer free. My thoughts at the time, understandably, were wrestling with the very present possibility of my father’s death. And as I started thinking and praying for my dad, a different thought crept into my head. “Garret one day you will die.” My mind started racing faster and faster as I began working myself into a panic. I can’t remember how the whole thing ended. But I got myself calmed down enough to finally sleep. This was the first time I started wrestling with my own mortality. I was scared because I was beginning to see that no one makes it out of life alive. Death is contrary to the will of God. It was never His desired outcome for His creatures. This is why earlier in John 12, when Jesus is confronted with the death of His friend Lazarus, he weeps. Death grieves the heart of God to the point of tears. However, what happen next is a foreshadow of what we will see in a few weeks when it is ultimately accomplished on Easter. Jesus has power over death. Revelation 1:18 says it this way, “I [Jesus] have the keys to death and Hades.” But in order to defeat death once and for all, Jesus will go to the cross and experience the same death that everyone of us one day have to confront. What this means is that even as we go into the grave, we are accompanied by the one who has dominion and greaves over our passings. 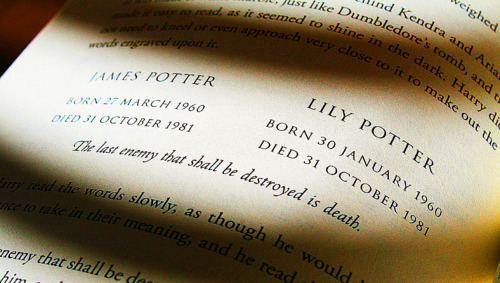 We are assured, in passage like today however, death will not have the last word. We will have a new life when God restores all things but this doesn’t make confronting the unknown monster that is the end of our life is any easier. We simply know that when the end comes, in it, we have good company. Here is what I am contemplating today: If Jesus joins me even in death, is there any place he wouldn’t go with me? What does it mean that death grieves over his friends who die? Read the mediation passage today a few times through. As you read is there a passage or a word the sticks out to you. Meditate on that phrase allowing the Lord to speak to you as you color. What is he saying?